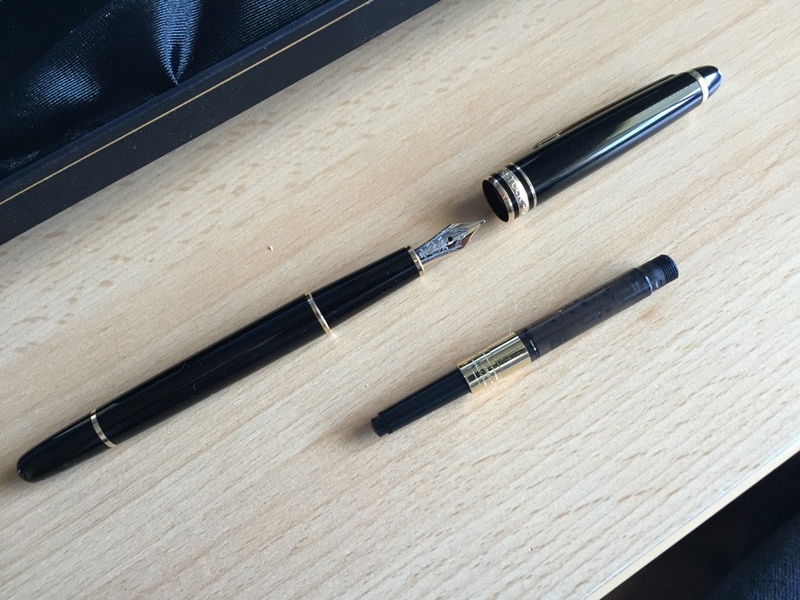 I have recently inherited a Montblanc pen from my mum who passed away just before Christmas. I know it is a Meisterstuck however beyond that I know very little. Pictures below. 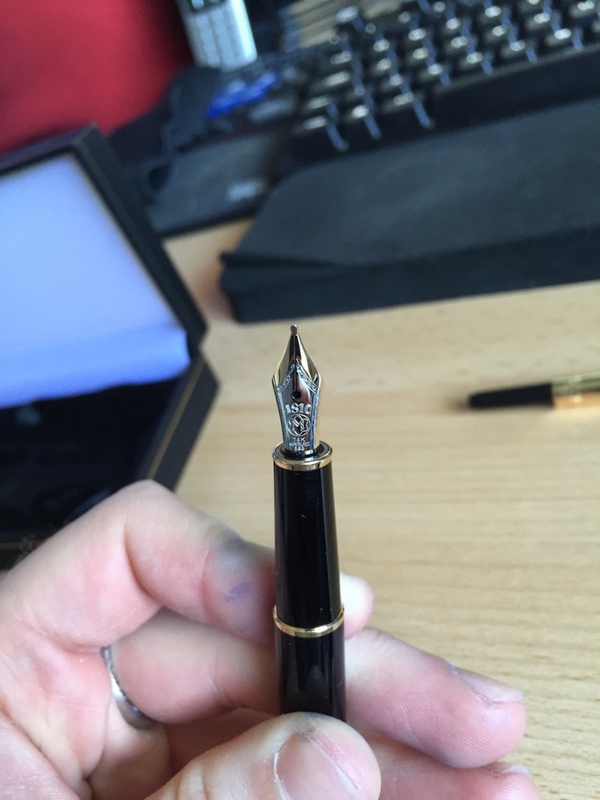 The pen appears to leak from the base of the nib into the cap which then makes its way onto my hand during use! Is it a repairable fault? If it's something I should get repaired (I definitely will due to the sentimental value) where should I take it in the UK (or send it off)? The pen is always stored in the case and not shaken around so I'm hopeful it's not just me! The pen is a Meisterstuck 144 C/C filler. It was called a Classique and this particular model with the push fit cap is no longer made. I’ve owned roughly 15-20 Montblanc 144 pens just like yours. Many of those pens were purchased used and many had the same issue you’re having. The good new is, it’s very likely that the pen does not need to be repaired (at least in my experience). The pen probably just needs to be fully flushed out. There’s probably a good bit of old dried up ink inside the section/feed which (again, in my experience) causes this same issue. 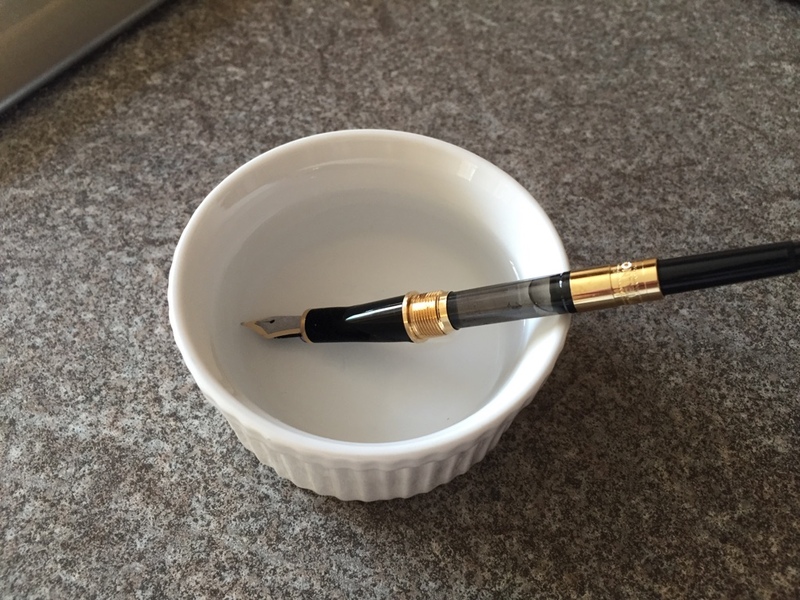 Use the converter to cycle warm water through the pen until there is no evidence of any old ink. After that, fill the pen completely full with warm water then let it sit in a small cup of warm water overnight. I’m willing to bet that you’ll wake up to find a pool of ink at the bottom of the water cup which is a good thing….the old dried ink is flushing out. I’d repeat this process over the course of 2-3 days and try the pen again. In a few cases, I had to add a small amount of ammonia to the water cup to flush dried ink that had been sitting in the pen for 20+ years. You may or may not already know this, but exposing pens to unusual climates can also cause this sort of thing. I’ve accidentally left pens in my car and come back to this same problem. High altitudes can also contribute to this problem as well. Also, leaks may be an issue. Try switching to a cartridge and see if the problem goes away. If so, just replace the converter. That is some impressive knowledge! I'm in the UK so if the suggestions below don't solve it I'll call my local authorised dealer. Brilliant thanks, I'll give that a try now! If flushing it through with warm water and soaking it overnight doesn't help I'll try that before going down the repair route. Thanks. Ok I flushed the pen through with warm water until it was as clear as it looked likely to get! A surprising amount of little black bits came out too...I assume old ink! The pen is now having a bath. The key with those I found is making sure the converter is *tightly* seated. If it isn't seated tight enough it will leak. They are pretty simple pens though so really should be OK after a good clean. If it still leaks I'd do as suggested, try a cartridge as the most likley issue is a converter with a bad seal. Cost of a couple carts could save you a repair bill from Montblanc. Current pen rotation: way too many! If I try cartridges do I need some sort of part as I'm assuming the cartridge won't screw in like the converter (that's the piston thing right? :P)? Great thanks. Wasn't sure if the push in cartridge would fit inside the thread or if I needed something else! If you do use the converter, please beware that the gold plated band near to the nib has a habit of corroding because of contact with ink. So I recommend that you always wipe it well after filling from an ink bottle. 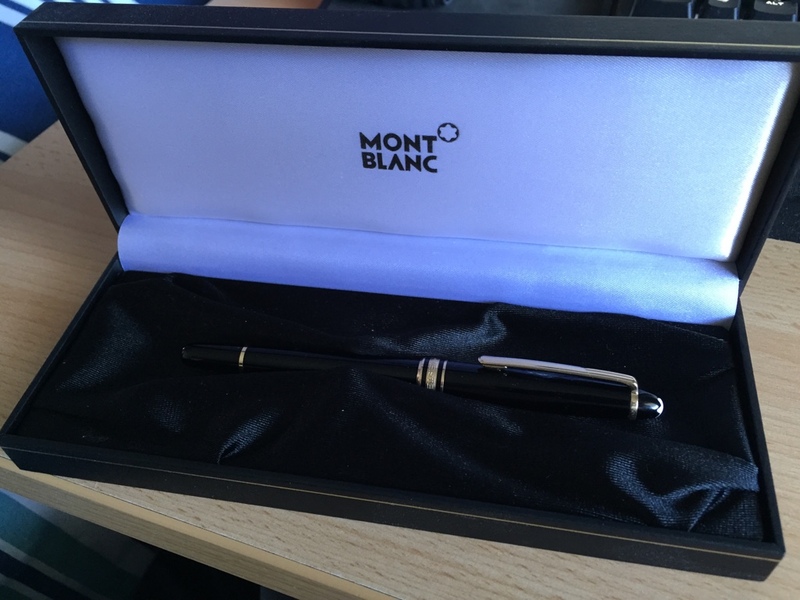 If you do eventually end up sending it to Montblanc for a service, they will probably change that as a matter of course anyway. I would have recommended flushing out the pen, but it looked so clean that I assumed you had already done that. I am following numerous topics here and on FPN, and it's lukewarm temp, never warm. What's correct? I always just use tap from the cold side; simply run the nib, feed and section under the tap and then wipe down. Me too, cold water. Flushing lasts longer, but it' safer, imho. also IMHO, depending of the pen and nib section, warm water might disolve sealant, if it exists, e,g. bee wax, right? The best temperature for the water should be about room temperature, about the same temperature as the pen. Then nothing can happen to any seals. It is pretty clean, I'd flushed it through before but not quite as in depth (no pun intended) as I am doing now! Thanks for the point on the band too, wouldn't have thought of that. So far it's been sat in water since about 4pm yesterday and I've changed the water a few times and flushed it through whenever I've walked past! A surprising number of little bits have come out so far...rather hoping they aren't bits of dried and ruined seal! I've just used warm water from the tap (easily cool enough to put my hands in! )...it also cools really fast in the little bowl I'm using. Surely anything that could get damaged is resin, metal or the seals and I'd guess that the resin and metal would take a lot of heat to damage and the seal around the base of the nib is likely silicone which is pretty resistant to heat! Last edited by richhaydock; April 22nd, 2015 at 11:04 AM. Especially a pen like this is *not* going to be hurt by warm water. There *might* be some very fragile old pens out there where water temp is a problem, but the sorts of plastics being used on these 144s? Pretty dang tough. but the sorts of plastics being used on these 144s? Pretty dang tough. That's what I thought...was still careful not to use too hot water though as whilst the pen may not be worth a huge amount it means an awful lot! Although I guess if the water was hot enough it could soften the sealant they use when mounting the nib in the bit you hold (I'm pretty confident this bit has another name)!